Tom and Sierra don't want to do a big wedding ceremony. Kevin and Josie convince them to do an afterparty at La Bonne Nuit. Tom and Sierra invite Moose and his dad (Marcus) to the party, but Marcus is dismissive of the invite. He had a high school crush on Sierra. Cheryl and Toni get their SAT scores. Both have done well enough to keep their dreams of university. Cheryl wants to get into Hysmith College, but the admissions have posed a roadblock to her alumnae status. Kevin wants Moose to come out and go as his date to his dad's wedding, but Moose is reluctant to do it. Josie invites Sweet Pea to the wedding as her date. He wants to be her boyfriend, but she doesn't want label. Hysmith board member, Penelope Blossom, changed the rule to keep Cheryl out of school. The Gargoyle King sends a letter to Sierra and Tom that they must complete Ascension Night or else they will be killed. Cheryl wants Kevin to find someone out and proud who will treat him well. Kevin loves Moose and wants to be with him. Later during the school annoucements, Cheryl creates an LGBTQ alliance and lightly outs Moose. Kevin breaks up with Moose unless Moose decides to come out. Toni gets mad at Cheryl for outing Moose and getting her kicked out of the Serpents. Cheryl promises to make things right. Josie has an audition lined up with an attendant from Juliard. Archie agrees to give her a ride to the audition. Veronica can scrounge up enough money to repay Hermione. Reggie plans to steal from his father's car dealership. Tall Boy was using the Gargoyle King as a cover to deal drugs; he wasn't the Gargoyle King from the 90s. The parents agree to finish Gryphons and Gargoyles. Josie performs for the Juliard rep.
Reggie stole the money. He ends up shot in the arm from the security team. Cheryl and Toni try photographing clients from the Maple Club; Penelope catches them. The couple blackmails Penelope by threatening to release the names of her clients. Josie doesn't make it into Juliard. Archie agrees to be Josie's date as a friend. A dye pack was inside the bag from the dealership. Reggie and Veronica can't use any of the money. Moose comes out to his father. He agrees to be Kevin's date to the wedding and wants to spend the night with him. The decision against legacies has been revoked. Cheryl uses her extra time to get Toni an interview with Hysmith college. Gladys Jones is the contact for the supplier. She agrees to let Reggie and Veronica makeup the money they still owe. She takes Reggie's car as payout and will step up a payment plan. Cheryl apologizes to Moose; they make ammends. Moose will be hooking up with Kevin in the bunker. 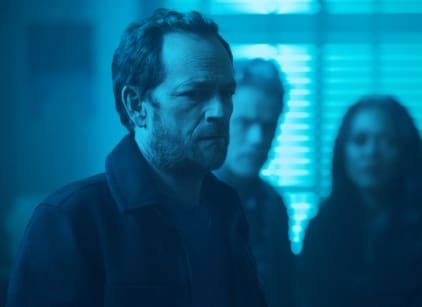 The parents break into Riverdale High; Penelope gives them all the antidote for the Gargoyle King's potential poison. Penelope finds a goat's skull in one of the classrooms with the message "Got You." The parents deduce that the Gargoyle King must be after their kids. The parents call their kids desperately, who are hooking up with each other. Kevin and Moose are apprehended by the Gargoyles. The group force Kevin and Moose to drink from the goblets. Before Kevin is about to drink a goblet, Cheryl shoots it off with an arrow. Major Mason is the man behind the Gargoyle King mask. The Gargoyles are members of the RROTC. Marcus Mason isn't the Gargoyle King from the 90s. He's a friend of Tom's who was sent to the Sisters of Quiet Mercy for his affection for Tom. The Sisters twisted his mind and made him a follower of the Gargoyle King. After he found out about Tom's upcoming wedding, and Moose dating Kevin, he concocted the plan to get his revenge. Gladys and Jellybean come back to Riverdale to stay for awhile. Sierra and Tom get married in a ceremony town hall ceremony. Josie and Archie perform a song together. Moose is moving to Glendale to be with his aunt. He can't live in Riverdale for the time being. Toni and Cheryl created a new all-female gang in town, the Pretty Poisons. Gladys and Jellybean concocted a plan to takeover the town. Josie and Archie kiss after their performance.